Android's built-in calendar app can display the contents of more than one Google calendar, integrating them together. These can include both calendars that you create yourself (for instance, separate work and off-hour calendars), as well as ones created by other people that you can read but not alter. 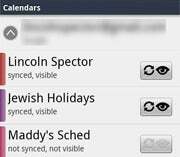 For instance, in addition to my own calendar, I display calendars for US and Jewish holidays. While in the Calendar app, press the hard Menu button below the screen. Then tap Calendars. a button for defining its status. If the button's eye icon is clearly visible, the app displays that calendar and all of its appointments. If the eye is grayed out, the appointments won't appear. You can probably guess from the other icon that the button displays whether the calendar app syncs with the calendar in the cloud. Find the calendar you don't want to see. Tap the button once to hide it but keep synching. Tap it a second time to turn off syncing, as well.